Austin, TX. 2017. SXSW. Christina Murphy is playing a show with her band, Forever Starts Today. Somewhere in the audience is Mike Ziemer, the man behind Third String Productions. The stage is nonexistent, creating a disadvantage for Murphy’s petite 5’3’’. The venue is nearly at capacity and she knows she has to do something to get Ziemer’s attention. It’s the band’s last song when she pushes through the crowd, hops up onto the bar and finishes the last few seconds of the song. Safe to say, they got Ziemer’s attention. Despite their entertaining stage presence and feel-good tracks, this album gave them the opportunity to open up and explore topics such as death and adversity. The title track touches on making it through abuse or any form of difficulty in someone’s life while the second to last track, “Alannah”, is the only acoustic track and is dedicated to a fan that passed away. The album still has their signature lively sound including stand-out track “I Don’t Want to Say”, dedicated to their hometown of Austin and the music scene that heavily influenced their band. “One thing that Christina is really fantastic about is taking these heavy and serious topics and putting some kind of positive spin on it without watering it down and still getting the raw and genuine emotion,” Hirschhorn said. 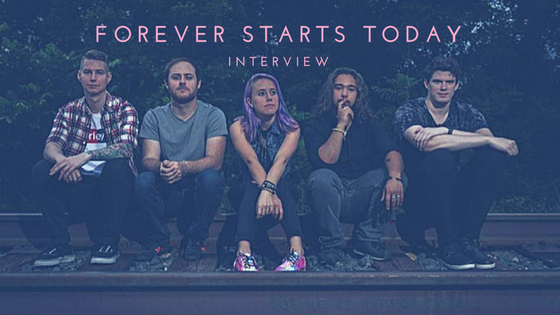 Forever Starts Today knows what it’s like to look to an artist or song for comfort in tough times. They know what it’s like to find honest, real music that connects with them. Now that they have the perfect recipe of musicians and lyrics, they’re hoping they can be that band for someone else.